Burger Bar was my first high-end, go-to burger in Las Vegas. Opened in 2004, this was generally my first stop in Las Vegas until, a few years later, I discovered the epic cheeseburger from Olives over at Bellagio. Don't bother with Olives now...it stopped being exceptional about a year ago. Still, I would pop into Burger Bar from time to time. I did note a subtle slide in the quality over the years, but it was still a fine burger, and I had never had a meal there when they were not utterly packed. Hubert Keller had often been credited with being the father of the gourmet burger trend, and I felt it only fitting that I spend some time there with my reviewer hat on. This was the place where it all started. Happy Meal and I quickly found a space at the back bar. Our cue to leave was when I asked the server at Burger Bar what cut of beef was used in the burgers. She looked at me like I had two heads, and then responded with "Uh....beef?" After a quick trip to the kitchen, she let us know that it was shoulder meat--Chuck. The base price of a burger at Burger Bar was $9.50, so 10 buck Chuck...sigh. We ordered a couple of the Black Angus Burgers. We could have gone with the all-natural (NatureSource) beef for a little more, or the American Kobe for a lot more, but it seemed pointless to spend more on Chuck. We settled in for a lengthy, 24-minute wait for the first attempt at a cheeseburger cooked to Medium. On the first try, my burger came out Well-Done. I sent it back, and the second burger arrived withing 2 minutes...that was impressive considering the time drag on the first attempt. I assumed that some other diner's wait just increased by about 24 minutes. Bloody Rare on a cool, untoasted bun. Do..Not..Want. 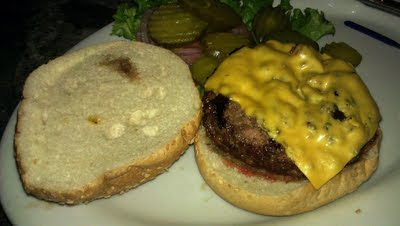 The Beef: Our server claimed that the burgers were 8 ounces, but I would have guessed that they were closer to 6 ounces. That was blessing, however. The beef was utterly and devastatingly bland. It had a very mild beef flavor and then......nothing. This was the equivalent of a warm snow cone without the syrup. There was no trace of the usual goodness that should have come from the melted collagen in a Medium Chuck burger. The claim, by my server, was that the beef was ground in-house, but if it was, it certainly did not seem that it had happened recently. The beef was coarsely ground, so the mouth feel was relatively satisfying. I took two bites and gave up on this burger. The fat content was hovering around 25%, and I didn't want to consume a lot of fat without the benefit of flavor. The bite was oily and moderately juicy. The Seasoning: There was none. I brought this up with the manager, and he claimed that Burger Bar has never seasoned their burgers. This struck an odd chord with me, and I just didn't buy it. Had I been enjoying bland burgers at Burger Bar for years? I just didn't buy the claim that Hubert Keller, would let ground Chuck stand on its own. In fairness, for an up-charge, I could have ordered any number of sauces, which would have added a savory note to the dish. I just assumed that the beef should have been satisfying and flavorful without smothering/masking it. 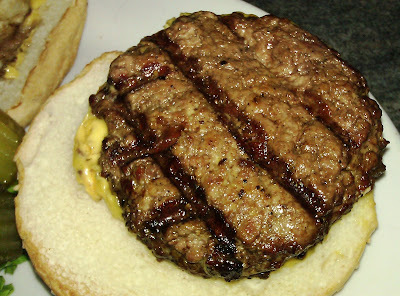 Burger Bar's first attempt at a Medium burger. The Sear: Even on the Well-Done, 24-minute burger there was not an appreciable sear. There were deep grill marks where the burger had languished on the thin grates of a too cool gas grill. This was really just picking nits. The bland, unseasoned beef would not have improved with a competent sear, since there was no actual flavor to develop and build from. The Preparation: Burger Bar formed the bland Chuck into appropriately loose and thick patties so that the grain and grind could be appreciated. However, they also turned the Well-Done version of my burger at least three times on the grill, which was a moisture-robbing no-no. The second attempt at delivering Medium burger was a rushed, bland, mushy Med-Rare. I gave up, and pushed my plate away after 2 bites. The Cheese: There were 8 cheese choices at Burger Bar. I ordered my burger with a slice of American cheese. The slice was thin enough to shave with. The fact that my second burger arrived within 2 minutes and the cheese was already mostly melted was evidence that the cheese slice was miserly. As a result, the cheese contributed in no appreciable way to the bite. In fairness, the beef was monstrously bland, so it would have required a really potent and hefty portion of cheese to make a real difference. The Bun: The buns at Burger Bar were sourced from Great Buns. I went with the seeded bun option. The first bun was on the dry side. The second attempt delivered a moist, fresh bun, which was also untoasted. As a result, the bottom bun was quickly reduced to a pasty, compressed, wet mess. The top bun was cool to the touch. This was the price of rushing out the re-fire. The seeded bun was fine. It was moderately yeasty and sweet. Had there been an appropriate portion of cheese or an adequate amount of seasoning on the burger, then this bun would have been a suitable match in terms of flavor. Had the the bun been warmed and toasted, it would have probably been good. If frogs had wings, they would probably fly. 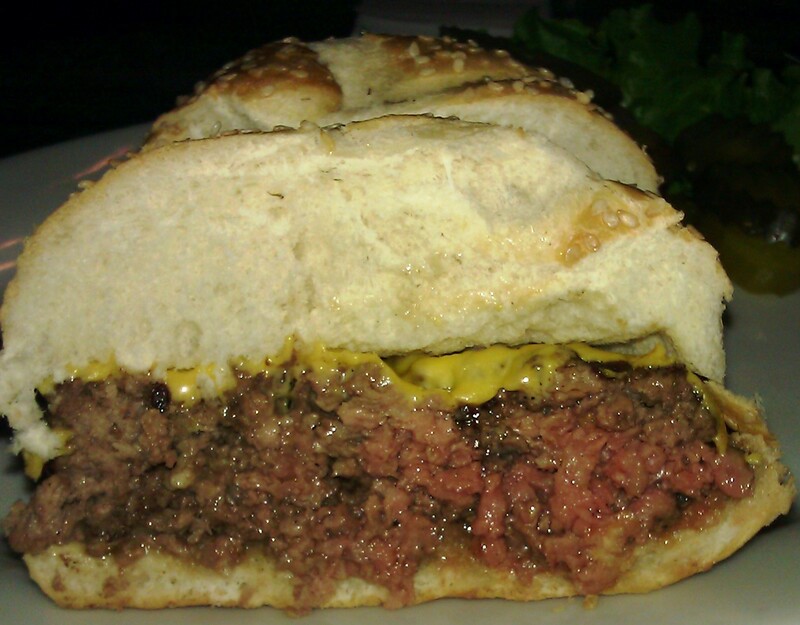 The Meat To Bun Ratio: This was fine in the case of the re-fired burger. The Well-Done burger, pictured above, was clearly dwarfed by the bun. The Sides: The fries and rings were properly and competently cooked in canola oil. None of the fried sides were properly seasoned. A fellow diner offered me a taste of her crisp sweet potato fries (no innuendo intended), and these, too, were not seasoned. 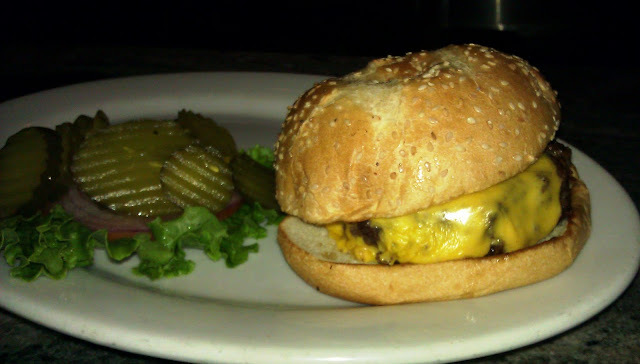 The Value: At Burger Bar, the value was exceedingly poor. My burger was comped, but I would not return to pay in excess of 10 dollars (cheese was extra) for a dreadfully bland burger. The group of young women next to me indicated that their turkey burger was equally unsatisfying. My estimation had been that the quality of the food at Burger Bar had been sliding into mediocrity for years. This was the year that it became unpalatable to me. Alas poor Burger Bar, I knew ye well. I am glad that had the chance to enjoy the burgers there when they were really good burgers. Truly, the burgers at Burger Bar were wonderful at one point in time. It seemed that the place, due to its popularity and reputation, was on autopilot. Burger Review : A bland puck of 10 buck, under-cooked Chuck...no thanks.